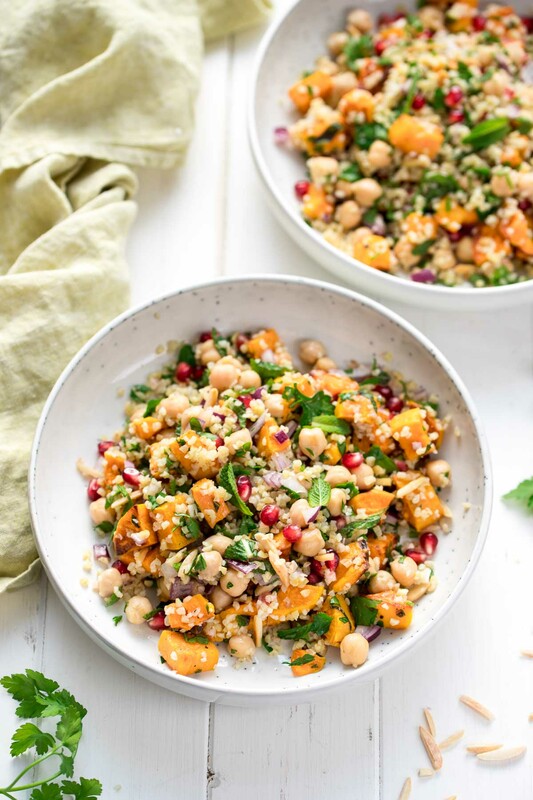 This simple recipe for bulgur salad with sweet potato, chickpeas, herbs and almonds makes the perfect side dish or main meal salad. I love the simple ingredient list and complexity of flavors and textures this combination makes. Bulgur, chickpeas, fresh parsley, mint and lemon are a dream team together. And ground cumin is right at home in this salad. Add sweet and creamy roasted sweet potato and crunchy slivered almonds, you have a dreamy tasting salad that even sweet potato nay-sayers will love. And it’s one that is perfectly suitable for vegetarians and vegans alike. Whether it’s for health or for taste, it doesn’t get better than this simple salad! This is again one of those salads that I do as dinner or lunch for two, and since it is simply too filling to pile away ourselves, there are leftovers. Which in my typical fashion I like to enjoy for breakfast. Yes, it makes great leftovers, so go ahead and enjoy this salad as a filling and satisfying bring to work lunch. You can easily pep up the flavor with a little squeeze of lemon or simply some crumbled feta cheese. Or even top it with some sliced sweet cherry or baby roma tomatoes. Revamping leftovers is a great way to give yourself the feeling that you are eating something new and not a repeat from dinner. It’s EASY and tasty! Yes, this salad is so easy to prepare and as simple as this recipe is, it doesn’t taste basic. It tastes delicious! Creamy, crunchy, nutty and fresh tasting all at once. The bulgur can be cooked ahead of time. Or you could sub it out for a gluten-free grain like quinoa or even millet. This salad makes for a perfect main meal salad since it is filling and satisfying and it packs great for lunches. 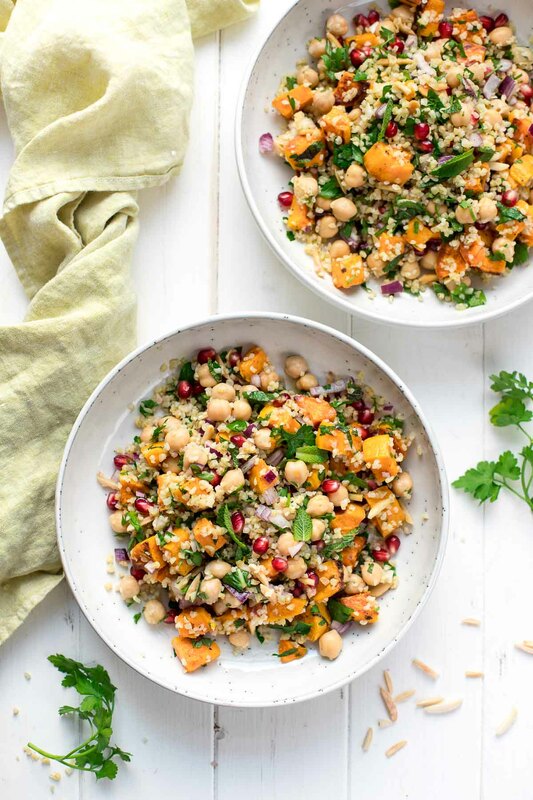 This fresh, herbed bulgur, sweet potato and chickpea salad makes a tasty and satisfying lunch. It's also a great side dish for the holidays. Pre-heat the oven to 400°F / 200°C and line a baking sheet with parchment paper. In a medium saucepan, cook the bulgur according to package instructions. Transfer to a large salad bowl to cool. Meanwhile, in a bowl, or directly on the baking sheet, toss the sweet potato with the olive oil and a pinch of salt and spread out in a single layer on the lined baking sheet, careful not to crowd them. Transfer to the oven and roast for 30-35 minutes, tossing halfway through. While the sweet potatoes roast, dry fry the slivered almonds, shaking the pan often, until golden. Transfer to a plate and set aside. In a small bowl, mix together the dressing ingredients until well combined. Add the chickpeas to the bowl with the bulgur, along with the red onion, parsley and mint. Pour over the dressing and toss to combine. Add the pomegranate, almonds and roasted sweet potato and gently toss again to combine. Feel free to top it with a little feta cheese, if desired. Make it gluten-free: trade out bulgur for quinoa or millet. 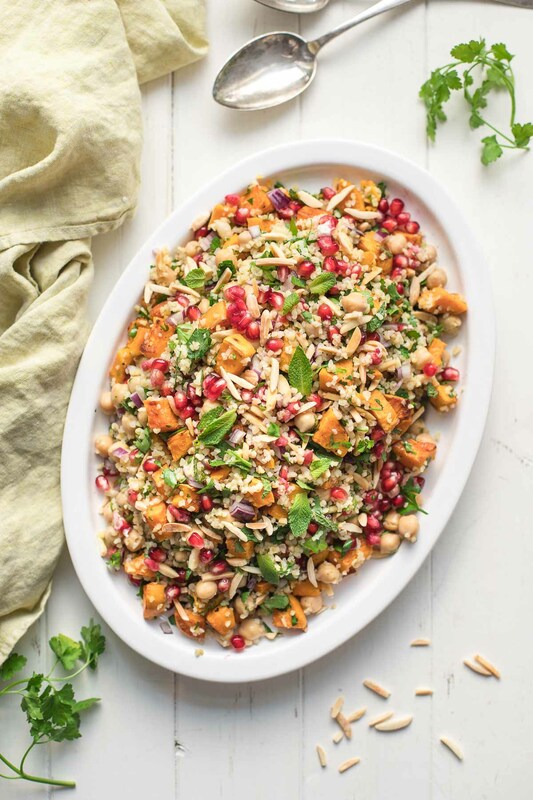 If you make this Bulgur Salad with Sweet Potato, Herbs & Almonds recipe, I’d love to hear how it turned out for you! Be sure to rate it and leave a comment below to let me know! Especially if you have tips for other readers. Or take a picture and tag me on Instagram @ellerepublic and don’t forget to hashtag #ellerepublic so I don’t miss it!